LOUISVILLE, Ky. – The Louisville lead was dissolving, down to two points, and the KFC Yum! Center went into active panic mode. The Cardinals had led hated rival Kentucky by 17 just a few minutes earlier, seemingly on their way to a thorough mauling of the nemesis that had beaten them four straight times. But then the resilient Wildcats started making 3-pointers, and Louisville mainstays Peyton Siva and Gorgui Dieng had four fouls each, and suddenly the joy had been sucked out of the packed 22,000-seat arena and replaced with a gnawing dread for all in red. Could Louisville really blow this? With the score 63-61, the irrepressible/uncontrollable/indescribable Russ Smith barged into the spotlight. He drew a foul from Kentucky’s Ryan Harrow and made two free throws. Then he fouled Archie Goodwin, who made the first and missed the second free throw. Then he grabbed the rebound of Goodwin’s miss, blasted off for the other end of the court, quick-fired a jumper that missed, sprinted to get the rebound and kissed in a bank shot. Elapsed time: 46 seconds. The Louisville lead expanded to five, and panic subsided. The only other time Kentucky got within one possession was at 77-74 in the final 35 seconds. Smith responded with a free throw for a four-point lead, and Louisville hung on for an 80-77 victory. Welcome to the Russ Smith Variety Show. It's part drama, part comedy. It is part audacity, part insanity. It’s an undersized and under-recruited junior guard making clutch plays few prep All-Americans would dare attempt, and also making foolish decisions that high-schoolers would know better than to try. It was 21 points and 20 shots – and several of those shots helped facilitate Kentucky’s comeback. It was seven rebounds for a spindly 6-foot-1 guard, three assists, three steals and three turnovers. It was the usual action-packed 30 minutes of playing time. You take the good with the bad with Russ Smith, and you take that total package in bulk. “He’s out of his freakin’ mind,” Rick Pitino said. And he said it with love. Because the improbable rise of Russ Smith as a s-s-s-star (hard to type with a straight face) has keyed everything Louisville has done last March and so far this season. So, Russ, are you really out of your freakin’ mind? Coaching Russ will either be the death of Pitino or the catalyst that takes him to a seventh Final Four and possibly a second national title. It’s a joy and a trial, an exercise in patience and a testament to trust – Pitino has to know in his gut that the good plays will outweigh the bad by game’s end. Not by the Big East, at least, the league that always scours Smith’s hometown of Brooklyn for talent. It took the endorsement of longtime Pitino friend and former assistant Ralph Willard for Louisville to offer him a scholarship, and after half a season here it appeared to be a mistake. In January 2011, Smith was battling injuries, insecurity and coaching indifference. He had never left the bench in eight of Louisville’s first 16 games, and his bags were packed to leave before Louisville played West Virginia. He finally got some unexpected playing time against the Mountaineers, and while it was no masterpiece – Smith went 1-for-7 from the field – it was enough to convince him to stay. Flash forward 23 months, and Russ Smith is an All-American. He leads the 12-1 Cardinals in scoring at 19.7 points per game, and his team-high 37 steals key the most persistent pressure defense in America. And he’s also Mr. Clutch. By sheer force of will more than anything else. 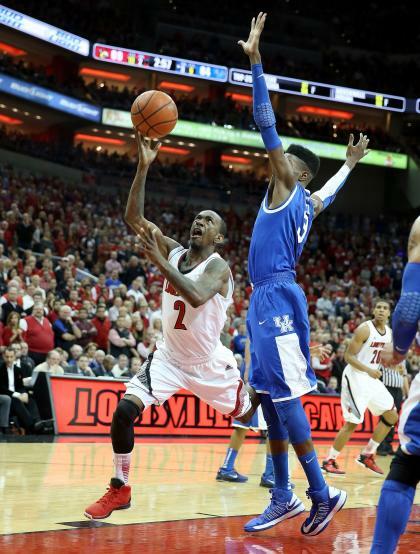 Russ Smith might lead the nation in believing in himself. Before his star turn, he was the struggling actor working as a Hollywood waiter convinced he’s the next DeNiro. He was the law clerk who envisioned himself on the Supreme Court. He was the scrub guard who was certain he had some Iverson in him, if only someone would give him a chance to prove it. Last year he got that chance, as the offensively challenged Cardinals turned to him to create some points. He responded well enough to help lead them to the Final Four, and this season the confidence has snowballed. 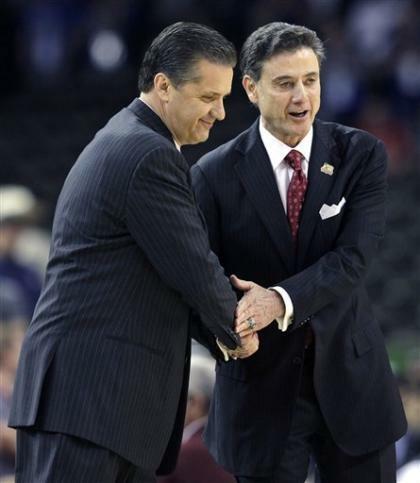 With Russ as the l-l-l-leading man, Louisville may be the team to beat in 2013. He is part of a veteran group that can guard with the best of them, and is much improved offensively. Sophomore forward Chane Behanan has diversified his offensive game, sophomore guard Wayne Blackshear has shown a solid stroke from mid-range and downtown, and Siva is playing the best basketball of his four-year career. Add in center Dieng, who missed seven games with a broken wrist before returning Saturday, and this will be a formidable team in the new year. Kentucky doesn’t have that many, but the core group of seven showed a lot in defeat Saturday. The freshman-laden Wildcats showed the trademark John Calipari intangible toughness to go with all the tangible talent. Looking at the two teams, they seem a mirror image of last year at this stage, when Kentucky beat Louisville in Rupp Arena: the Wildcats were a strong national title contender, while the Cardinals were an intriguing team with the chance to get a lot better by NCAA tournament time. This year it’s Louisville that is on the short list of title contenders, while Kentucky is an improving squad that could crash the Final Four. 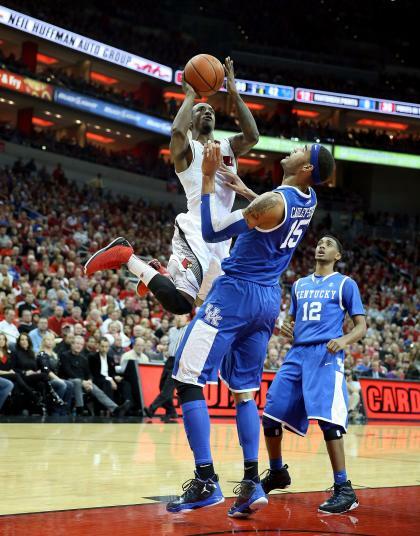 With much of that improvement ahead, Louisville played Kentucky at the right time. But it still took another installment of the Russ Smith Variety Show for the Cardinals to escape with a victory.